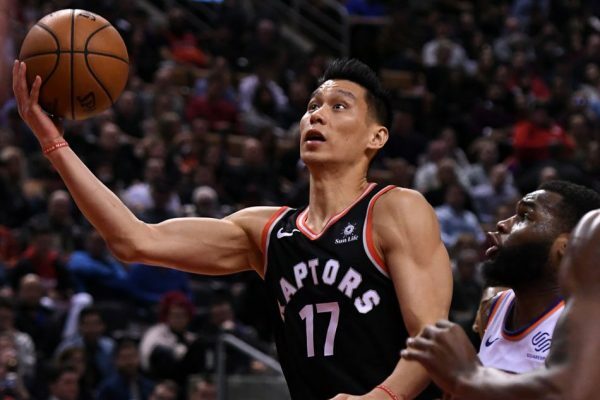 Garbage time or no, New York Knicks or no, Jeremy Lin had his best game in Toronto Raptors uniform, finding a deft touch from all sorts of ranges, hopefully paving the way to more consistent shooting and performances. Lin finished with 20 points in 27 minutes, connecting on 7-of-11 including one three-pointer in the 128-92 win. It was his first 20-point game since January (still playing for the Hawks) and his 4th 20+ game of the season. However, he didn’t really get going offensively until late in the game. Earlier on, Lin’s defense stood out. He’s been playing really well on that end since joining Toronto (it was less consistent on the Hawks). Earlier on Lin took it to the paint a few times, not letting the presence of Mitchell Robinson scare him away from going to the rim. He took a couple of hits on the floor that way, but I think his aggression on both ends (even if it didn’t deliver points) early on in the game set the stage for his hot hand later. And when the points did come? They rained. Sure, the game was basically over at that point, but for Lin, it was less about playing his part in the team’s win; it’s more of a chance to get it going again. Yes, he got some of those baskets from his most comfortable spots, but he mixed it up and didn’t just escape to his comfort zone. It’s been a season of ups & down; downs for Lin, but playing in a much more competitive atmosphere (which is a good thing), his shooting against the Knicks has to have continuity, or come playoff time, his playing time will take a hit. Perhaps even before that. Lin’s stats so far: 64 games, 19.9 minutes, 10.2 points, 3.3 assists, 45% from the field, 30% from three, 83.5% from the line. 何以见得… 我觉得他只是对FVV刚回来很兴奋，想要看看他能做些什么吧？而且就像你说的，无论高峰低谷，球员一般上都会”back to the norm"，范会回到平均值，林也会，林的平均值本来就高于范。而且你低估了换队融入的困难度，这一点几乎多个记者，林本身和纳斯都有提及，mid-season changing is tough.